A new generation of African younger leaders is rising to the challenge of missions. Many young professionals and university students are responding to the call to serve in strategic areas of missional engagement. Any careful reflection on leadership for the twenty-first century church will involve significant consideration of the transitions and transformations taking place in the church in Africa and other global South continents. The global diversity of the church as the community of God’s people presents the challenges of interdependence, relationships, and structures that need to be nurtured for effective partnerships for the mission of the church. Our common mission arises out of our common identity in Christ. This must inform all reflection on a biblical paradigm for effective mentoring of emerging leaders and partnering for mission. The massive movement towards Christian faith in the global South creates the need firstly for new effective models of geographical partnerships between the church in the global North and the church in the global South. In the coming decades Christian mission to all parts of the globe will require resources from both the North and the South to be successful. This calls for a renewed emphasis on intentional cross-cultural engagements in the humble spirit of the Christ. Secondly, there is the need for reflection on new models of structural partnerships for global mission. Many emerging leaders in the global South church are directly impacted by the relationship between the local church and the mission agencies. There is a fresh opportunity to explore new structural partnerships with the current resurgence of church planting movements seeking to re-emphasize the role and involvement of the church at the cutting edge of mission, particularly in the global South regions. Thirdly, there is the need for reflection on effective generational partnerships for mission. For the church to remain vibrant and faithful in its obedience to global mission through all generations till the ‘end of the age’, a key focus must be on leadership development and transitioning of kingdom leadership from one generation to another in stewarding the fulfilment of God’s promises in the global mission of the church. Fourthly, effective partnerships for global mission will grow out of authentic cross-cultural friendships. These would be friendships that exemplify and strengthen our foundational relationship in Christ. Friendship has a very significant impact on partnerships for the gospel. In today’s world of instant communication, short attention spans, and material development as mission, the sacrificial practices of friendship stand as evidence for the kingdom ethics of God’s love for all people. I conclude with a challenge for the church to re-emphasize and re-engage the priority of the ultimate partnership with God in the missio Dei. As we celebrate the dynamic growth of the church in Africa and the global South, it is of utmost importance that we remind ourselves that mission is first and foremost about God and his redemptive purposes and initiatives in the world. This relationship to God should be the foundation for all other partnerships in relation to the global mission of the church. Conditioned through modernism, secularization, and postmodernism, the upcoming generations of mission leaders need to hear afresh Jesus’ instructive words to the disciples, ‘I am the vine; you are the branches. If you remain in me and I in you, you will bear much fruit; apart from me you can do nothing’ (John 15:5). The kingdom of God is established only through the power of God. This ultimate dimension of partnership with God can accomplish the faithful finishing of the global mission (Rev 7:9-10). As we celebrate the dynamic growth of the church globally, it is time to engage the new generation of global mission leaders in embracing the challenge and beauty of kingdom partnerships for the gospel. It is common practice in Ghana now for thousands of Christian university students of diverse denominational affiliations to spend about three to four weeks of their summer vacations involved in Students-In-Church Evangelism (SICE) programmes. They are contributing in dynamic ways to indigenous church planting and foreign missions. This reality strengthens our joy in sharing in collaborative global mission efforts as we earnestly continue to pray ‘your kingdom come’! The global diversity of the church as the community of God’s people presents the challenge of interdependence, relationships, and structures that need to be nurtured for effective partnerships for the mission of the church. Jesus tells the disciples: ‘And this gospel of the kingdom will be preached in the whole world as a testimony to all nations, and then the end will come’ (Matt 24:14). The Great Commission is, ‘Go and make disciples of all nations’ (Matt 28:19). Our common mission arises out of our common identity in Christ. This must inform all reflection on a biblical paradigm for effective mentoring of emerging leaders and partnering for mission. The experience of Peter recorded in Luke chapter 5 is insightful. It was evident that one of the essential lessons that Peter learnt in the quest to fish for people is the need for partnerships. After the miraculous catch of fish, Luke records: ‘So they signalled their partners in the other boat to come and help them’ (Luke 5:7). This priority for partnerships should be normative for the mission of fishing for people if the global church is to carry out effectively its God-given mission across cultures and regions in this century. First, this shift creates the need for new effective models of geographical partnerships between the church in the global North and the church in the global South. Paternal relationships must give way to a new paradigm of kingdom partnerships of trust, mutual respect, and sharing of resources and leadership, with a common commitment to the one mission of the gospel. Triumphalism must be buried in its various expressions in both the North and the South. Escobar remarks that ‘despite the shift of Christianity to the South, in the coming decades Christian mission to all parts of the globe will require resources from both the North and the South to be successful’.5 This calls for a renewed emphasis on intentional cross-cultural engagements in the humble spirit of the Christ. Many emerging leaders in the global South church are directly impacted by the relationship between the local church and the mission agencies. There is a fresh opportunity to explore new structural partnerships with the current resurgence of church planting movements seeking to re-emphasize the role and involvement of the church at the cutting edge of mission, particularly in the global South regions. Thirdly, there is the need for reflection on effective generational partnerships for mission. When Jesus commissioned his first disciples with the promise, ‘And be sure of this: I am with you always, even to the end of the age’ (Matt 28:20), there was in that promise an implicit commission to disciple the next generations also. How does the global church adequately develop mature Christ-like next-generation leaders for its mission in an increasing diverse context? Faithful stewardship of inter-generational leadership transitions as an intentional partnership for the gospel and global mission will raise up new leaders at various levels across the global church. Fourthly, effective partnerships for global mission will grow out of authentic cross-cultural friendships. These would be friendships that exemplify and strengthen our foundational relationship in Christ. On the final night, Jesus said to his disciples, ‘I have called you friends’, and gave them the affirmation, ‘I chose you and appointed you so that you might go and bear fruit—fruit that will last’, re-emphasizing, ‘This is my command: love each other’ (John 15:15-17). This relationship to God should be the foundation for all other partnerships in relation to the global mission of the church. Jesus emphasized this truth to the disciples by saying, ‘All authority in heaven and on earth has been given to me. Therefore, go and make disciples’ (Matt 28:19). 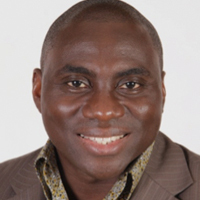 Nana Yaw Offei Awuku was the Lausanne Regional Director for English, Portuguese, and Spanish speaking countries in Africa (EPSA) until September 2016. Nana Yaw has been on staff with Scripture Union Ghana for over 20 years and currently serves on the Senior Management Team as the Director for Field Ministries. Nana is married to Beth and they live in Ghana with their three children. He is currently on a two-year study break at Gordon-Conwell Theological Seminary (Boston). Nana has been invited by Lausanne to serve as Director for the Younger Leaders Generation initiative (YLGen).